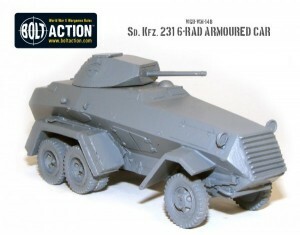 Warlord Games has their new 6-Rad Armored Car up on their website for Bolt Action. The first in the line of true German armoured cars, The 6-wheel drive Sd.Kfz 231 had excellent mobility. Used in Aufklarungs units (reconnaissance) during the early stages of the war they saw action in the Fall of France, the Blitzkrieg attack on Poland and during the invasion of Soviet Russia. Germy is holding a raffle on their website. All proceeds go to a good charity. You should go check it out. 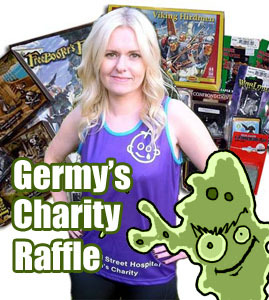 On the 22nd April Germy's sister is running in the London Marathon and to help raise money for her choosen charity 'Great Ormond Street Hospital' I have decided to run a raffle. Several companies and individuals have kindly donated miniatures to the prize fund. To enter the draw all you need to do is sponsor Germy's sister. For details of the prize and how you can enter the draw see our website. Guts N Gears has their Templecon 2012 wrap-up show now available on their website. - Intro music and speech dediciated to Jamie Perkins Champion of Templecon 2012, 1 of the 8 Brits who attended this amazing convention. - Andrew, Paul & Craig on Templecon 2012 and 2013 to come!! - William, Ed & Lyle on their Templecon 2012 exp and allot more. Anvil Industry has some new weapon pieces to help customize your minis. Anvil Industry is one year old today, we'd like to thank all our awesome customers for their support in our first year, and promise bigger and better things to come in the next year, Kicking things off with a massive expansion of our Modular Assault Rifles range. Gamers can now choose from three different designs, two different sizes, five different ammo feeds and a range of accessories including the new Suppressor/Silencer and a "short" grenade launcher ideal for submachine gun type weapons. We also have available an automatic shotgun, with integral Drum Mag, and a set of brutal Chain Glaives for when the fighting gets up close and personal! 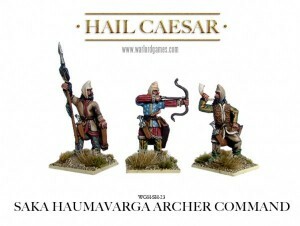 Warlord Games continues their releases for Hail Caesar with their new Saka Haumavarga Archers. Saka was the name the Persians gave to all Scythian tribes. The Saka Haumavarga lived north west of Bactria, in modern day Uzbekistan. Although the Saka, and all of the steppe peoples usually fought on horseback Herodotus describes them as fighting on foot in Xerxes army. Some were also stationed as marines in his fleet. Armorcast gives us a look at some of their Late March releases. Kabuki Models is now selling just their Night Wings backpack as a separate bit. We release new back pack with wings. Previously featured on our Dark Knight limited edition miniature. On the Table Series 3 Episode 4 is now available for your viewing pleasure. In this episode we have some truly exceptional releases with Warhammer Forge's terrifying Basilisk, the entrance of the Soviet forces into the Weird World War of DUST, to some great fantasy football players from Greebo, topped off with the third part of our how to play Infinity tutorial. On the Table is sure to fill that wargaming gap in your life. Pulp Figures has posted up their new releases for March. Games Workshop is releasing new Empire models and rules for Warhammer Fantasy. They have included 360s of models on their website too. At the very heart of the Warhammer world lies the Empire, the largest and most powerful of all the realms of Men. Beneath the resplendent banners of the Elector Counts march vast armies of proud warriors, every one of them ready to live, fight, and die for the glory of the Empire. It is these brave soldiers that defend the Empire from attack - from brutal hordes of Orcs, the shambling monsters of the Vampire Counts, and the endless legions of Chaos. With mighty war machines, regiments of stoic troops, the armoured might of thousands of knights, and the raw power of magic, the Empire has defeated countless foes a thousand times over. We fight for Karl Franz and the glory of the Empire! The armies of the Empire are an eclectic mix of warriors at the best of times, ranging from the unwashed common soldiery to the aloof Elector Counts. Your basic warriors, the State Troops, are professional soldiers, and for the most part they fight because the pay is good. Many of them will die on the field of battle, but this is nothing to be afraid of - there are plenty more civilians to take their places. Meanwhile, the nobility can do what they do best: charge into battle on mighty steeds, dispatch their foes with casual distain, and twirl their moustaches as the enemy flees into the distance. It's a glorious life. Fantasy Flight Games posts a preview article on army building in Dust Warfare. In the upcoming Dust Warfare, armies clash for supremacy on the battlefields of an alternate reality where World War II continues. 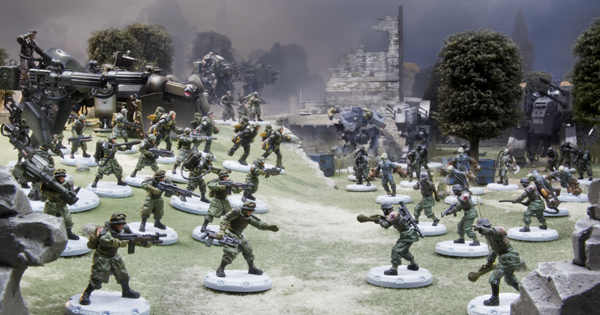 However, before you command your forces in battle, you’ll need to assemble an army using the versatile army lists included in the Dust Warfare: Core Rulebook. One of the many appeals of Dust Warfare is the amount of control and customization you have over your forces. This game features a dynamic army building system that uses platoons, small and flexible groups of units and support vehicles that can be customized to complete any mission. In this preview, we’ll look more closely at the process of creating and equipping an Allied army list. We’ll focus on an Axis army list in a future article. 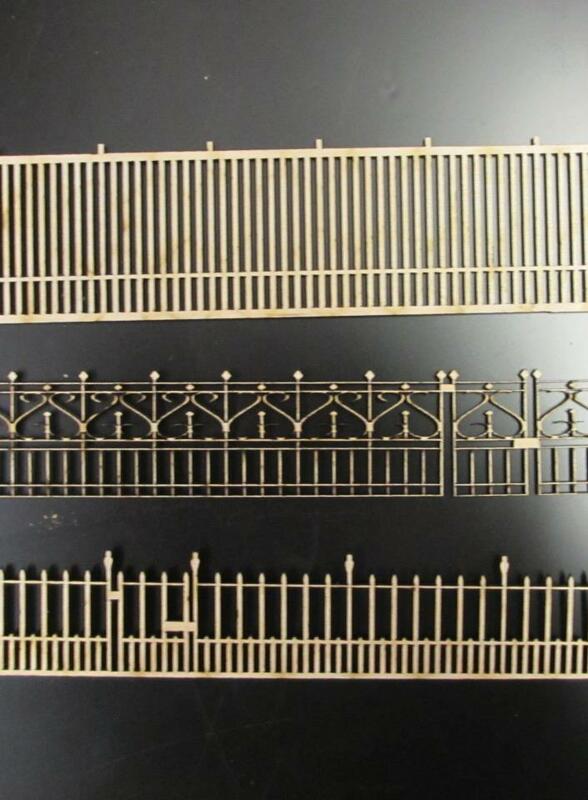 Fenris Games releases new fence and railings for different sizes. Last releases for March - three more railings. 35mm tall security fence; and 25mm tall Victorian Canterbury and Brunswich pattern fences....all into the shop today if I get chance before closing for the weekend. Puppets War releases a new arm for walkers. Set contains two Walker Laser Cannon arms that can be assembled as either left or right. 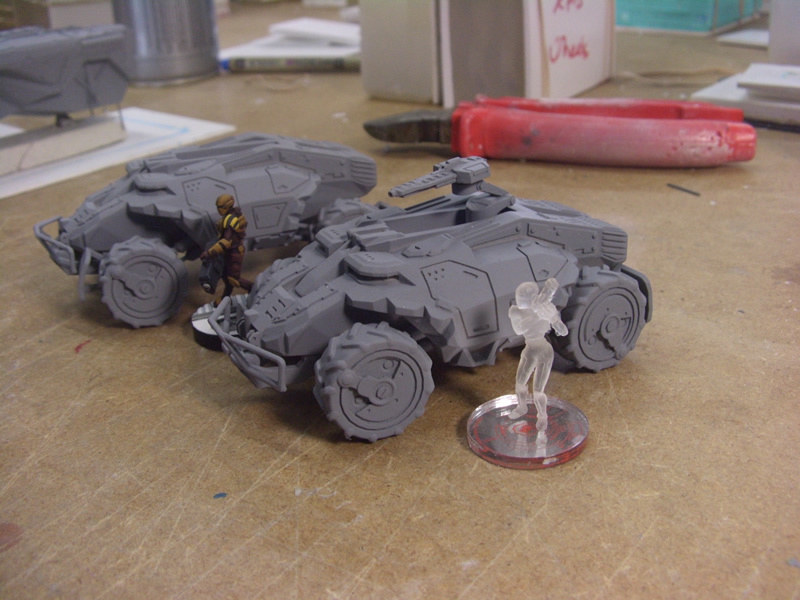 Designed to fit 28mm tabletop wargames scale, supplied unassembled and unpainted. Tor Gaming announces their new volunteer program the Reliquary. It is an honourable undertaking for one to walk the path of the Reliquary, a path that is littered with excitement and fulfilment, where hidden knowledge and untold wealth is waiting to be harvested at every turn. There is no limit to the riches that can be gained from serving the Reliquary and many rare artefacts are rewarded for the efforts of the noble. Common items of wonderment are also readily available and can be earned easily and chosen to suit ones personal tastes. Join the honoured Reliquary now and get your share of the riches! Deep Cut Studio expands their terrain line with 2 new additions. Make your table dynamic! Deep-Cut Studio announced the latest addition to their tribal buildings line. This time it's a set consisting of ore mine and a shed. 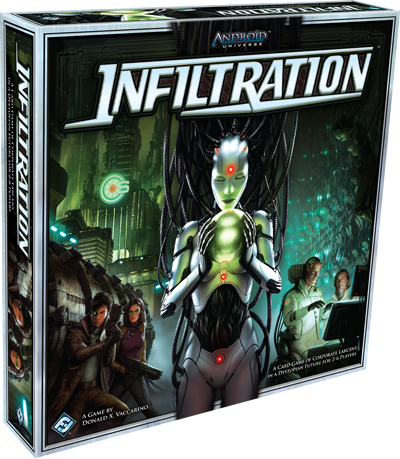 Fantasy Flight Games previews their new game, Infiltration, the upcoming card game of futuristic larceny. 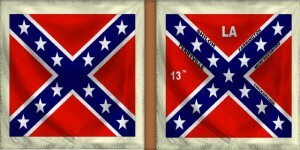 Grimsby Wargames Society is once again helping your ACW flags with their free 13th Louisiana flags. Louisiana flag sheets in both 15mm and 25mm free to download on the main website. Spartan Games gives us a look at their new releases for Dystopian Wars (and there are a LOT of 'em!). Here at Spartan Games we’ve had a fantastic response to the introduction of the Republique of France to Dystopian Wars, and our next release brings more upgrade models to significantly increase players’ options when building a French fleet. 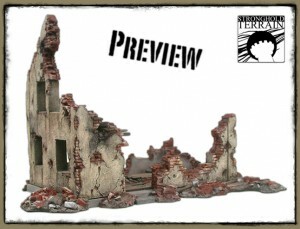 Stronghold Terrain shows off a preview of a new modular ruined building terrain piece on their website. Also, news about the breeding pool previously shown here. This building is the first of our new modern terrain line. It will be released on the 07.04.2012. The ruin is a very modular piece. It comes in 3 main parts (2 corners and the front piece). You can place them in many different ways as one building or several. Additionally all rubble pieces are removeable. If you need more space for your miniatures you can remove them. If you like it you can place a preorder at our shop. Victory Force will be holding a giant sale on April 1st (and no, it's no joke). On Sunday April 1st 2012, Victory Force will have its biggest day of Specials ever! Keep watching the blog for details. Sorry once the specials end, that day, they are over and I cannot give the special prices after they have ended. Specials cannot be used with any coupon codes or other offers. Warlord Games is giving you a real opportunity to easily get into their hew Pike & Shotte game with these starter army bundles. With the pre-orders for our forthcoming Pike & Shotte rulebook now open we’ve pulled together these great starter army deals so you can easily start a new force and save yourselves a few pounds at the same time! Check these new army deals out here. 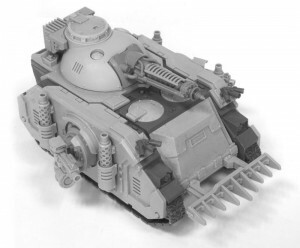 Forge World gives your Marines a bit more firepower with the Diemos pattern Predator tank. The Predator is a highly effective medium tank designed to provide Space Marine detachments with heavy fire support in the heat of battle. An ancient and revered design, cited by the Codex Astartes as a spiritual mentor, no less, there are almost as many patterns of Predator as there are of the ubiquitous Rhino hull it is based upon. One such variant is the Deimos Pattern, manufactured in the vast forges that occupy the moons of Mars. Miniature Building Authority has some new 15mm terrain pieces for your wargaming needs. 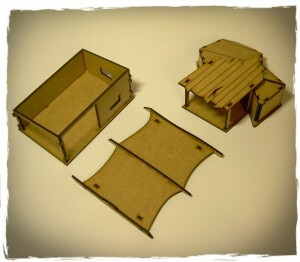 Direct Terrain has produced five new 15mm field fortifications for your WWII gaming needs. These are unpainted. As with all of our direct items they can only be purchased at www.miniaturebuildingauthority.com or when you see us at the conventions. Also, Like us out on Facebook and Twitter. We are adding promo shots and layouts of customers terrain among other topics. Spartan Games gives us a look at their new releases for Firestorm Armada. 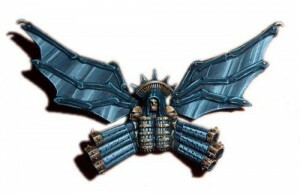 The next set of releases for Firestorm Armada includes the first model of a new faction: the Oroshan Imperium.